Over the past years, alongside its central task of economic development, Party Committee and People’s Committee of Phu Yen province have always paid due attention to leading and directing the implementation of defence and security tasks, with a focus on building strong, extensive militia and self-defence force. After the promulgation of the Law on Militia and Self-Defence Force, the Province has laid down leadership and direction measures to build this important force and obtained positive results. Up to now, it has built 314 militia and self-defence units, including 112 commune-level ones, 202 self-defence units, 35 active militia and self-defence squads in communes, wards and towns of key defence and security. The militia and self-defence force has promoted its core role in performing the military and defence tasks, being a credible political force to protect local party committees and authorities, while actively maintaining political security, social order and safety, and taking part in natural disaster prevent and mitigation, search and rescue in the areas. Those results are attributed to regular leadership and direction of party committees and authorities at all levels over the building of the militia and self-defence force. Building strong, extensive militia and self-defence force represents an important task related to various agencies and sectors, which requires close, focalized, unified leadership and direction of party committees and authorities at all levels as well as the combined strength of the whole political system and the entire people. Perceiving that, the Provincial Military Command has proactively counselled the Provincial Party Committee and People’s Committee to draw up and issue resolutions, action plans and guiding documents, and step up the work of education and propagation to raise a sense of awareness and responsibility and achieve a consensus among party committees, authorities and people. During the process of implementation, the Province has directed party committees, authorities, sectors and localities at all levels to strictly adhere to the procedure for building militia and self-defence force as well as the motto “people know, people discuss, people appoint, people take care of”, while successfully carrying out the work of inspection and supervision to opportunely detect, rectify and overcome limitations and weaknesses. Moreover, it has attached the building of militia and self-defence force and commune-level military command to the completion of grass-roots level political system’s structure. Since 2013, the Provincial Military Command in cooperation with party committees and authorities at all levels has selected and sent 71 cadres to study at the Infantry Officers’ Training College No.2 and Military Region 5 Military School, while launching 2 training courses financed by local budget for 122 cadres to study at the Provincial Military School. Due to the impacts of market economy, many young people at the age for military service often work far from their home, causing difficulties for the work of management, training and mobilization. Thus, the Provincial Military Command has counselled the Provincial People’s Committee to direct local committees, organizations, party committees and authorities to correctly review and assess the quantity and the quality of their militia and self-defence force, and seriously observe the regulations on registration and management of citizens of military service age. To enhance the quality of management of sources of militia and self-defence personnel, the Provincial Military Command has drawn up plans to improve professional competence of cadres and staff directly responsible for verifying and managing militia and self-defence force, while stringently maintaining the regulations on first-time, supplemented leave, long-term leave and arrival registration. Priority has been given to cadres and staff of agencies, businesses, service companies as well as graduates from universities, colleges and vocational schools that experienced military training courses so as to supplement human sources for the militia and self-defence force in the area. At the same time, it has directed agencies and units to actively apply software for registration, statistics and management of the militia and self-defence force, make plans for militia and self-defence force mobilization, training, drill and extension as well as attached plans for support when situations occur. Phu Yen has 4 coastal districts, towns and cities whose major economic sector are fishing and aquaculture. At the present time, the Province possesses 5,297 vessels, including large-capacity offshore fishing ones with 21,316 employees at the age for militia and self-defence service. This is an important force to perform the task of protecting national sovereignty and sovereign rights over seas and islands. To organize this force and effectively promote its role, the Provincial Military Command in cooperation with the Department of Agriculture and Rural Development of the Province has counselled the Provincial Party Committee and People’s Committee to direct localities to implement the Project of the Ministry of National Defence on “Building groups of maritime militia vessels and vehicles”. Up to now, the Province has built 2 maritime militia platoons and 27 coastal militia squads in 4 maritime districts and cities. However, organization and building of the maritime militia force have faced difficulties as personnel, organization and structure of maritime militia units have been not stable. In addition, since fishing activity is seasonal, and owners of vessels employ workers from various localities, communes and wards’ maritime militia units have been founded but in fact not connected with their vessel owners. To deal with that situation, in the time to come, the Provincial Military Command will continue to work with authorities, sectors and coastal localities to build mechanism for close, unified direction and management of maritime militia force. Due attention will be paid to registration of main fishing workforce and investment in equipment and means for vessels. At the same time, it will innovate the work of training and exercise to enhance the capabilities of maritime militia force, particularly fishing vessels regularly operating in the Spratlys and the Paracels, while combining maritime economy development with the exercise of national sovereignty over seas and islands and facilitating fishermen’s coordination with the Coast Guard and other relevant forces to fight against foreign forces’ violations of sea and island sovereignty. During the process of force building, the Province has attached great importance to improving the quality of training and drills, regarding this as a breakthrough step to enhance the militia and self-defence force’s task performance. Grasping and executing the Resolution 843-NQ/ĐU, dated September 23rd 2013, by the Provincial Military Party Committee on improving the quality of training in the 2013-2020 period and beyond, localities have conducted the work of training militia and self-defence force comprehensively and focally; while making it relevant to organizational structure and task of each force (mobile militia, on-the-spot militia and self-defence, and arm militia and self-defence) as well as realities of the area and regulations of the Militia and Self-Defence Force Law. 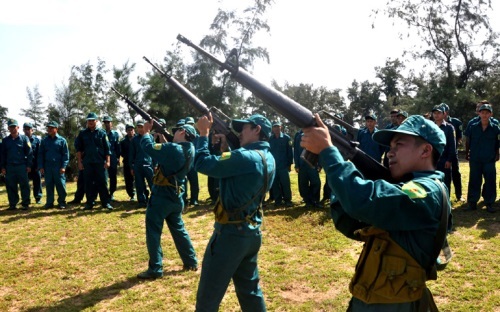 To produce good results, the Province has focused on preparations, particularly strengthening the system of training grounds and aids and improving knowledge for militia and self-defence instructors. During the process of training, the Provincial Military Command has directed agencies and units to step up innovation of the training work on the basis of closely combining military training with political, law education and mass mobilization. Notably, the Province has directed military agencies at all levels to complete the system of operational documents of the militia and self-defence force in accordance with the Regulations on staff advisory work of the militia and self-defence force, while involving this force in defensive zone, search and rescue drills as well as joint patrols with the Public Security Force, the Border Guard and the Coast Guard to improve the combined strength and the task performance of militia and self-defence cadres and soldiers, which has been highly appreciated by party committees, authorities and people. Together with the above-mentioned measures, great importance has been attached to ensuring the militia and self-defence force good policies and entitlements. Basing on the Militia and Self-Defence Force Law and the Project on organization, training, operation, entitlement and policy regarding the Militia and Self-Defence Force, military agencies at all levels have worked with functional agencies to make budget forecast, receive, effectively manage and use the budget, sufficiently provide executive compensation for militia and self-defence cadres as regulated, while investing in purchasing uniform, vehicles and equipment for the force. Most of the militia and self-defence cadres and soldiers keep their mind on work, being ready to undertake and successfully fulfil the assigned task. Those results have provided a foundation for Phu Yen province to continue to build strong, extensive militia and self-defence force, greatly contributing to the successful implementation of its military and defence tasks.